Hi, we are the Chaplaincy Team. Lucy, Halle, Coadey, Jack, Will, Isabelle, Charlotte, Macy, Mimi, Ethan, Caspar, Charlotte, Harriet, Harry and Millie. This is a picture of some of us on the Diocese Pilgrimage to Glastonbury Tor. 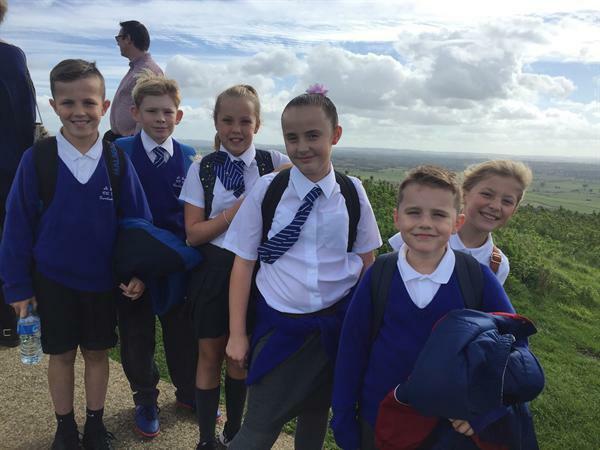 We went to Glastonbury Tor with the chaplaincy teams from lots of other Catholic schools. We have been considering the Bishop's letter to schools about the end of the Year of Mercy. To continue the Corporal Works of Mercy we would like our school to focus on 'Feed the hungry'. The bishop has asked us to consider local and international charities. We would like to support our local food bank and maybe raise money for an international cause to stop hunger. Our aim this term is to get this started. 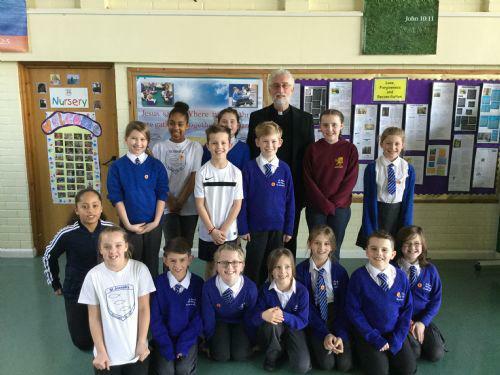 We enjoyed our chaplaincy training on 27th January at Corpus Christi School in Weston Super Mare. We made an action plan for the year and would like to Focus our work on The Corporal Works of Mercy, namely, 'Feed the Hungry'. One of our first objectives is to have a regular food collection box for our local food bank.